During WWII, the American homefront was separated from the war front. There were no battles fought on American soil. Not so for the British people. They did not suffer invastion, but England was bombed on repeated occasions. The piercing sound of air raid sirens became a daily occurrence – sometimes multiple times a day. As a result, citizens had to regularly protect themselves from falling debris or buildings. There were several options available. 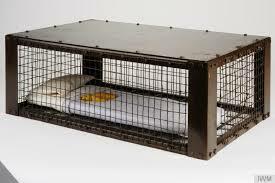 England's Ministry of Home Security issued a pamphlet “Your Home as an Air Raid Shelter” that uses over twenty pages of text, diagrams and photographs to describe how a house could be altered to keep inhabitants safe. Instructions covered everything from a “garden shelter” (an open trench) to a “refuge room.” A companion piece written by the Welfare Adviser to London, Mrs. Creswick Atkinson, was entitled “A.R.P at Home – Hints for Housewives.” It asked questions such as “Is your shelter clean and always ready for use?” Certainly an area of housekeeping I had not considered! 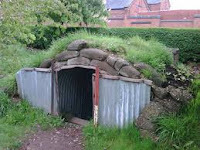 Anderson and Morrison shelters were another option available to home owners. Anderson shelters were named after Sir John Anderson, then Lord Privy Seal, who initiated their development. The shelters were designed to accommodate up to six people. 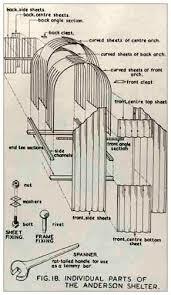 The main principle of protection was based on curved and straight galvanised corrugated steel panels. A small drainage sump was often incorporated in the floor to collect rainwater seeping into the shelter. The shelters were 6 feet high, 4 ½ feet wide, and 6 ½ feet long. They were buried 4 ft deep in the soil and then covered with a minimum of 15 inches of soil above the roof. 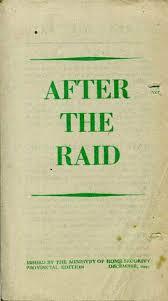 Another publication from Home Security entitled “After the Raid” discusses the need to make plans about what to do in the event someone's house was destroyed, how to find food and shelter, receive compensation for damage to houses, how to replace damaged furniture and other belongings, and tracing friends and relatives. This last section is what brought the war to a more personal level for me. It made me realize the constant uncertainty the British people lived with (and those in other countries impacted by bombings and battles). They had no idea when they left the house each morning whether they would have a home and/or family to return to that evening, or if they would be caught spending the night in a communal shelter or one of the Underground stations.